Looking for an awesome activity for your wedding guests? 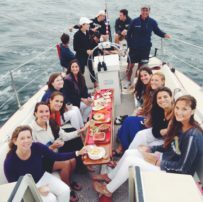 Pre-or post-wedding sails aboard Aquidneck are the quintessential Newport activity for your wedding guests! Newport has one of the prettiest harbors in the U.S. and is the sailing capital of the world. 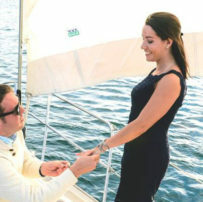 Whether you hold your ceremony on board or show your wedding guests Newport from the water, a sail aboard Aquidneck is a terrific and memorable activity for all. No sailing experience is required. 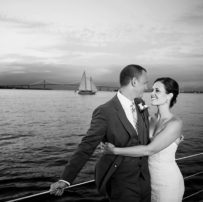 If you’re looking to tie the knot on the water, a Newport wedding aboard Aquidneck makes for a unique and unforgettable event. We know every inch of the harbor and bay and can provide the perfect backdrop; be it a lighthouse, island, estate or the bridge for your special day. Wedding officiants as well as food and drink may easily be arranged. 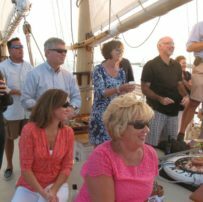 Most of our wedding guests and parties opt for a private charter aboard Schooner Aquidneck. 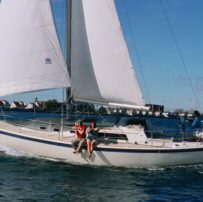 Aquidneck is specifically designed to be a charter boat so she is very comfortable to sail on and has plenty of room for guests to get up and move around. See the Aquidneck page for more information on the boat. 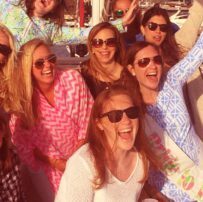 *If you have a group larger than 49, we can help coordinate with several nearby boats to take over 150 guests sailing! Submit a Private Charter Inquiry Form and we will be sure to get back to you, or for additional info call John Hirschler at (401) 862-4718.